Is your new year’s goal to get more quilts done? Our 2019 APQS longarm quilting machine line-up can help you keep at least one resolution this year! These new features will make your quilting simple and fun, and will definitely help you cross projects off your list! Enjoy more space to do what you love. 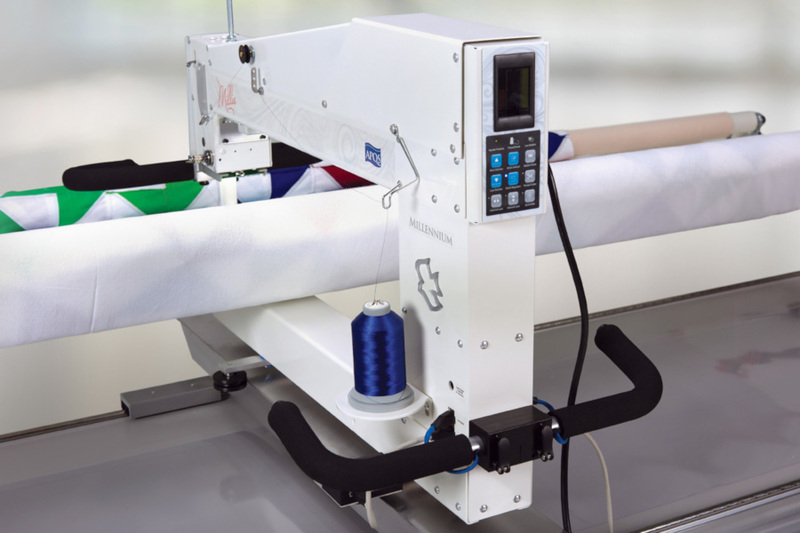 We’ve kept the same superior quality materials that let us offer an unbeatable lifetime warranty on all our longarm systems. But we’ve reimagined our throat and table design combination to offer even more quilting space for bigger patterns, bolder blocks, and bountiful borders! You won’t need to advance the quilt as often, so you’ll get more quilting done in less time. Our machines are built by hand using the finest grades of aircraft aluminum, so they are incredibly lightweight and easy to move. Your circles will be rounder, your curves will be smoother, and you’ll be able to quilt longer without muscle fatigue. See your quilting in a new light. 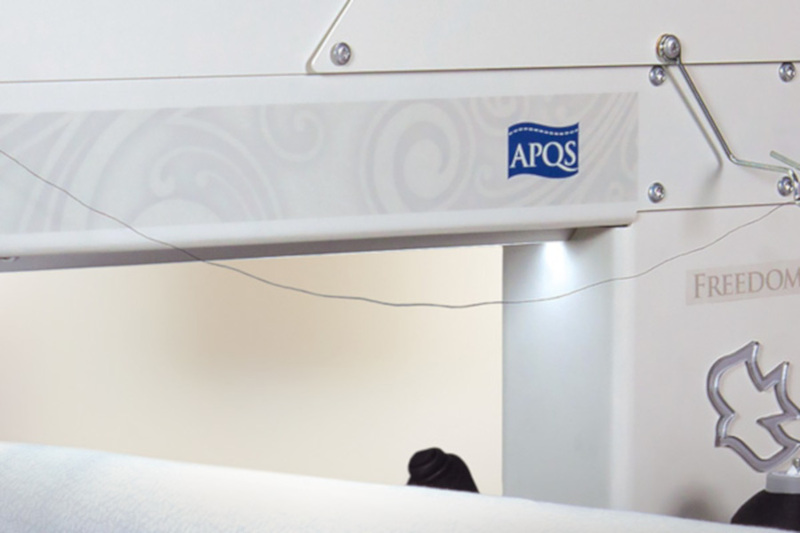 APQS machines have used innovative LED light technology for over a decade, bathing the needle area with bright light to make your quilting stitches easy to see. We’ve expanded that technology to inside the machine’s throat with our 2019 models, shining bright light all the way from the needle to the back of the throat for even greater visibility. Use the handy switch on the needle light to convert it to black light – very helpful when using white thread on white fabric, or when working with busy prints. Or turn the needle light completely off to help create shadows that make quilting dark fabrics easier. The LED throat light also includes a switch so that you can control each set of lights independently to suit your needs. 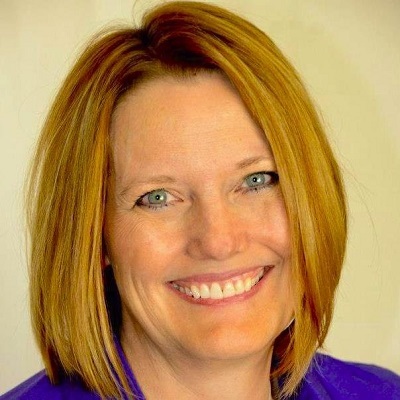 Get comfortable – really comfortable! 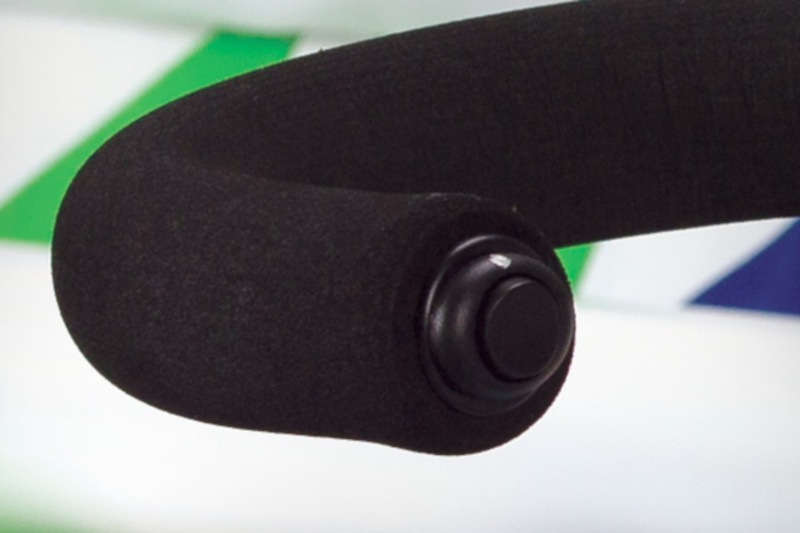 We’ve incorporated our adjustable front-handle technology into the rear handles on our 2019 machines, giving you even more flexibility and comfort when stitching pantograph designs. 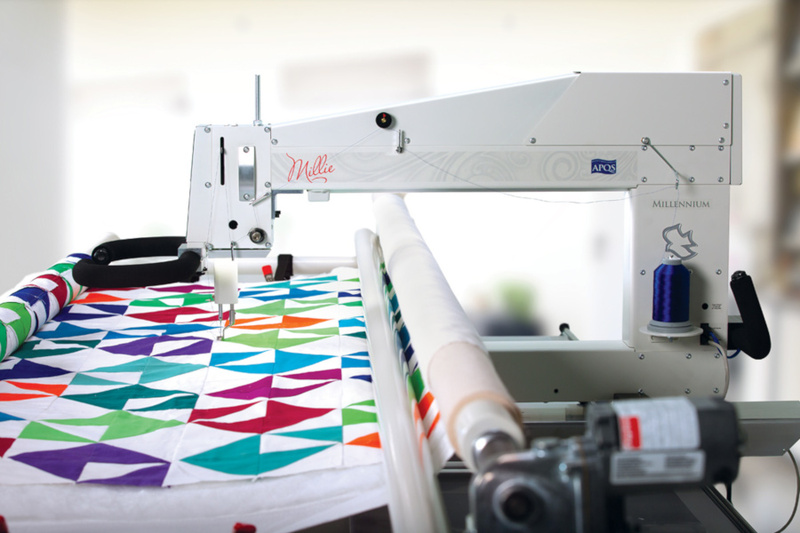 Each rear handle adjusts independently to find the angle that best fits your quilting style and comfort, and gives you the most control. Some quilters like to use both handles when quilting, while others like to stand to the side of the machine and use only one. The adjustable rear handles provide the versatility to make everyone happy! Plus, a simple, single switch on each handle lets you place single stitches, pull up your bobbin thread, and even start the quilting machine. Whether you’re right or left-handed, you can easily control the machine no matter which handle you’re gripping. Sometimes creativity can’t wait – an idea must blossom before it fades! 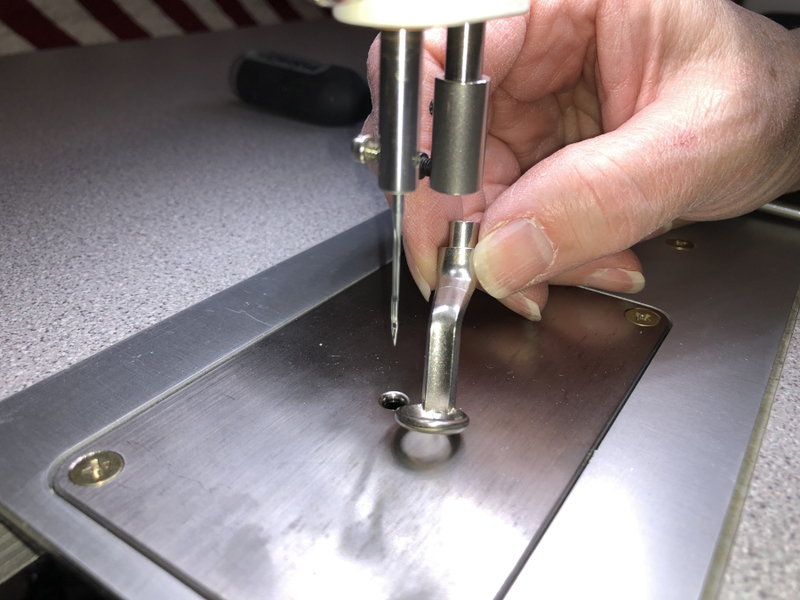 We’ve adapted our optional accessory feet to be super easy to change so you can quickly move from using templates and rulers with the standard template foot to having clear, unobstructed vision with the low profile, open toe foot. Other optional feet are available for all kinds of quilting projects. Click here to learn more about which APQS model is right for you. Correct machine height and ergonomic features will allow you to quilt for many hours without fatigue and strain on your body. What's the difference between manual mode & stitch regulated mode? When the APQS Millennium, or Mille, longarm quilting machine was introduced to the quilting world in 1999, everyone was mesmerized because it came equipped with a new feature called a Stitch Regulator.